Our weekend plans were derailed due to the snow. In our area of town we basically didn't get anything. We could see it doing a freezing rain/snow most of the day but because of ground temperatures it never actually laid on the ground. Although it was mighty cold and miserable out. However, my grandmother called at 9am on Saturday morning to tell me that it was "snowing to beat the band" at her house and that they had postponed the parade until next week. Even though I wanted to see her, we decided it would be for the best to just postpone our trip to next weekend so we could do the parade. Thankfully we didn't have any plans next weekend either. With the weekend suddenly opened, Jason decided to get Piper's room painting finished. He got both coats of paint on and even steam cleaned the carpet. Thanks to her many squeezing of toiletry products on her carpet, it really needed it! Then on Sunday morning, I started the wallpaper border thinking I could do it myself but then remember mid-sticking up that you really can't do it yourself because someone has to hold it on the wall while the other moves down and puts more up. I've done this 2 other times before (with it at the ceiling) - why do I always think I can do it myself? Jason came running and we finished. I was sweating like a maniac when we were finally done. Putting up a border is hard enough - I can't imagine doing an entire room. The border looks really great against the paint color we chose - Violet Mist - but I still have to go back over it and repaste a few of the edges down. I'm so thankful to have such a tall husband - had he been any shorter we would have needed 2 ladders/step stools to accomplish the task. Of course as we were putting it up he told me that if he had a house by himself, he would NEVER EVER wallpaper again. Ha! I will post photos of the completed room once we get Piper's mattress later this week and can put her new bed together. She's been having major bedtime and sleeping issues the past few nights and I wonder if this transition to her room could be the cause. Although both Caroline and Bryce had bedtime issues around the age of 3 too. It's wearing me out! It takes over an hour to get her to go to sleep. She keeps getting out of bed. Thankfully, Caroline and Bryce don't have issues with this anymore most nights. I feel like I'm breaking a new colt sometimes. She's just got to learn that we always win! Aside from Jason being the paint guy on Saturday, I ran down to the farm to pick up our CSA stash. We only have a few more weeks left of pickup and I'm going to miss going down there although Saturday proved that having it delivered in the winter will be nice. It was frigid and wet and because it was so cold in the barn too, they had a "honor" system in place for taking your order. In addition to the fresh veggies, I got some of their homemade strawberry lavender jelly. Yum! Then I got home and started cooking. Homemade chicken noodle soup and pumpkin bread. The house smelled so good! Finally after dinner, we carved a pumpkin. 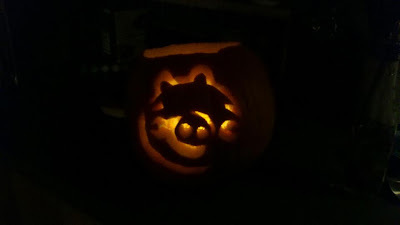 The kids had a bunch of little ones that they painted but I only got one to carve. We went with the Angry Birds theme and Bryce picked one of those pesky pigs! The kids helped to sort out the pumpkin pulp from the seeds and while doing that Bryce ate some raw seeds and took some bites of raw pumpkin. (Not the pulp, the actual "fruit.") He said it tasted really good - weirdo! Of course we roasted the seeds and I couldn't believe how quickly they devoured them after they came out of the oven. So tonight will be a cold Halloween! Funny how variant temperatures on Halloween can be here - Caroline's first Halloween it was almost 80 degrees that day! We had her in this puffy bumblebee costume and she was sweltering. Tonight I will have to figure out how to keep the kids warm without messing up the look of their costumes. Darth Vader doesn't wear a coat, mom! Thankfully, Piper's Snow White wig should keep her little head warm. I remember the 3's and sleep problems...ugh, it was awful. Wishing you luck in that department! Can't wait to see Piper's "new" room!